Pulmonary rehabilitation and severe exacerbations of COPD: solution or white elephant? Hospitalisations for severe exacerbations of chronic obstructive pulmonary disease are associated with significant physical and psychological consequences including an increase in symptom severity, severe reductions in physical activity, a deleterious effect on skeletal muscle, impaired exercise tolerance/ability to self-care, decline in quality of life, and increased anxiety and depression. As these consequences are potentially amenable to exercise training, there is a clear rationale for pulmonary rehabilitation in the peri/post-exacerbation setting. Although a 2011 Cochrane review was overwhelmingly positive, subsequent trials have shown less benefit and real-life observational studies have revealed poor acceptability. Qualitative studies have demonstrated that the patient experience is a determining factor while the presence of comorbidities may influence referral, adherence and response to pulmonary rehabilitation. Systematic reviews of less supervised interventions, such as self-management, have shown limited benefits in the post-exacerbation setting. The recent update of the Cochrane review of peri-exacerbation pulmonary rehabilitation showed that benefits were associated with the “comprehensive” nature of the intervention (the number of sessions received, the intensity of exercise training and education delivered, and the degree of supervision) but implementation is demanding. The challenge is to develop interventions that are deliverable and acceptable around the time of an acute exacerbation but also deliver the desired clinical impact. Severe exacerbations of chronic obstructive pulmonary disease (COPD) requiring hospitalisation place an enormous burden upon healthcare systems. Up to 75% of COPD costs are accounted for by exacerbations , largely through the costs of hospitalisation . In 2008, there were 822 500 hospital stays in the USA with COPD as the primary diagnosis, with a further 3.2 million stays that included COPD as a secondary or complicating condition, resulting in aggregate costs of $6.1 billion . In many countries, exacerbations of COPD are one of the commonest reasons for emergency hospital admission . Furthermore, severe exacerbations of COPD requiring hospitalisation are associated with high rates of readmission following discharge, with >20% of patients readmitted within 30 days  and a third readmitted within 90 days . Despite the importance of this global healthcare problem, there is a paucity of evidence-based pharmacological interventions designed to alleviate the consequences of a severe exacerbation of COPD [7, 8]. Pulmonary rehabilitation is defined by the American Thoracic Society and European Respiratory Society as a “comprehensive intervention based on a thorough patient assessment followed by patient-tailored therapies that include, but are not limited to, exercise training, education, and behavior change, designed to improve the physical and psychological condition of people with chronic respiratory disease and to promote the long-term adherence to health-enhancing behaviors”  and is the cornerstone of nonpharmacological treatment in patients with stable COPD. Over the past decade, there has been a growing evidence base for the application of pulmonary rehabilitation in the peri-/early post-exacerbation setting, culminating in a highly positive Cochrane review in 2011 , which suggested that pulmonary rehabilitation in the exacerbation setting may have positive benefits on readmission and survival, as well as exercise tolerance and health-related quality of life. Based on this Cochrane review, international guidelines and consensus statements have recommended that patients with COPD should be offered pulmonary rehabilitation within 4 weeks of hospital discharge [9, 11]. However, recent clinical trials and observational studies have raised questions not only about patient uptake, adherence and acceptability but also clinical efficacy [12–15]. 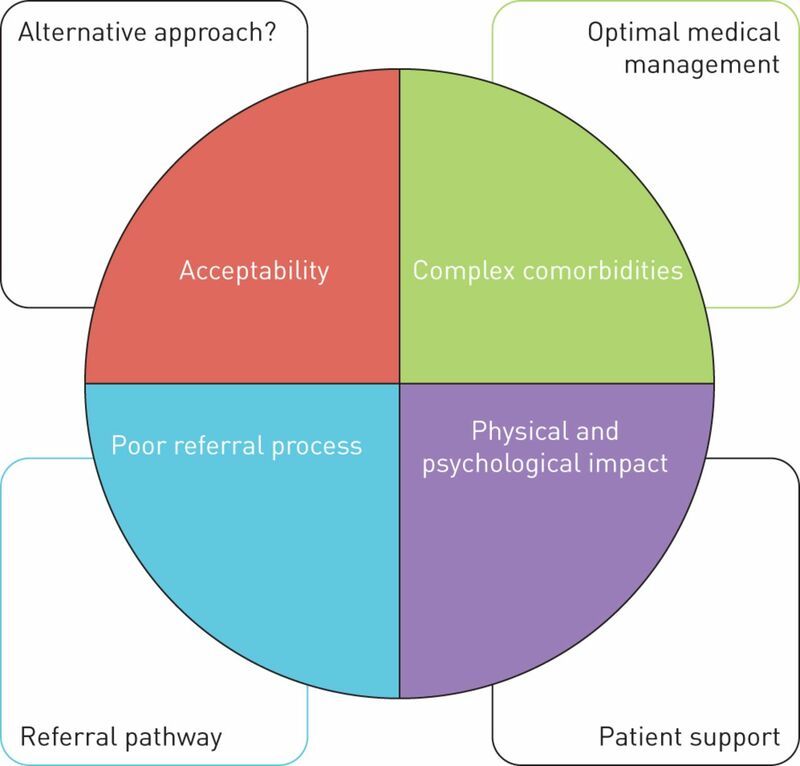 This review summarises the physical and psychosocial consequences of a severe exacerbation of COPD, providing the rationale for pulmonary rehabilitation. The findings from the recent update of the Cochrane review of peri-exacerbation pulmonary rehabilitation will be described, and we discuss recent studies that provide insight to some of the barriers to implementation such as comorbidities and patient beliefs. Finally, the review presents data from recent systematic reviews of self-management interventions (some of which incorporated exercise-training) as an alternative solution in the peri-exacerbation setting. Severe exacerbations of COPD have a devastating effect upon patients. The EXACT-PRO study group demonstrated that exacerbations are associated with a significant quantitative change in symptom severity rather than the development of new symptoms . Patient surveys reveal that this change in symptoms with an exacerbation has a momentous impact upon activities of daily living, with almost 50% reporting a cessation of all activities or becoming bed/couch bound [17, 18]. This has been corroborated objectively by observational studies using triaxial accelerometers to quantify daily physical activity in patients hospitalised with COPD . Pitta et al. demonstrated that at day 2 of hospitalisation, patients spend only a median 7% of daytime hours on weight-bearing activities (standing and walking), which increased negligibly to a median 9% by day 7. Even at 1 month following discharge, median time spent in weight-bearing activities was significantly lower than that observed at the baseline state [19, 20]. The effects of severe physical inactivity in older adults were demonstrated by Kortebein et al. in a 10-day bed rest model. In comparison to the pre-bed rest state, there were large reductions in muscle protein synthesis, lean mass (particularly of the lower extremities) and leg muscle strength. Similar findings have been observed in real-life clinical settings: Spruit et al. observed a 5% decline in quadriceps strength between days 3 and 8 in a hospitalised cohort of patients with COPD with only partial recovery by 90 days from admission. Although physical inactivity is an important phenomenon, severe exacerbations of COPD are also associated with other factors that may have a deleterious effect upon skeletal muscle function, including systemic inflammation, oxidative stress, blood gas abnormalities, corticosteroids and malnutrition . The loss of muscle mass and reduction in muscle function in COPD is associated with impairment in exercise tolerance and health-related quality of life . Following a severe exacerbation, there is a well-described decline in field walking test performance [25, 26] and ability to self-care [27, 28], which are associated with increased risk of readmission . Aside from the physical manifestations, psychosocial consequences are also prominent. The effects of severe exacerbation on health-related quality in patients with COPD are well described . Kon et al. recently demonstrated that patients with COPD on the day of hospital discharge had higher COPD Assessment Test (CAT) scores (worse health-related quality of life) than stable hospital outpatients or symptomatic patients referred for pulmonary rehabilitation. The mean change in CAT score from hospital discharge to 3 months after discharge was –3.0 (95% CI –4.4– –1.6). Mackay et al. showed that the CAT score rose from a mean±sd value of 19.4±6.8 in the stable state to 24.1±7.3 with a community-based severe exacerbation (p=0.001). The recovery in health-related quality of life to baseline took ∼14 days. In questionnaire surveys, symptoms of depression, anxiety, panic, resignation and anger are frequently reported with exacerbation . In a hospitalised COPD cohort, Harrison et al. recently showed that significant anxiety and depression were present in >50% and >40% of patients, respectively. Given the significant physical and psychosocial consequences of exacerbation, and the benefits of pulmonary rehabilitation in the stable setting , there is a clear rationale to assume that pulmonary rehabilitation may have benefits in the peri-/immediately post-exacerbation setting. Although trials of rehabilitation in the acute setting are a relatively recent phenomenon, a Cochrane review of pulmonary rehabilitation after a COPD exacerbation was published in 2011, which included nine trials involving 432 participants . The meta-analyses showed that pulmonary rehabilitation reduced the risk for hospital readmissions substantially (OR 0.22, 95% 0.08–0.58) compared with usual post-exacerbation management and had a beneficial effect on mortality (OR 0.29, 95% 0.10–0.84), although the mortality data was heavily based on a single, small trial . Across trials, large and consistent effects of pulmonary rehabilitation were seen on symptoms, health-related quality of life and exercise capacity. Based on this systematic review, international guidelines and consensus statements have recommended the provision of pulmonary rehabilitation after an exacerbation of COPD [9, 11]. The British Thoracic Society guidelines made a grade A recommendation that COPD patients “should be offered pulmonary rehabilitation at hospital discharge to commence within 1 month of discharge.” However, they also referred to practical issues of organising such post-exacerbation programmes. Since 2011, a number of additional trials have been published and some have shown little benefit from pulmonary rehabilitation after a COPD exacerbation. In these trials, adherence to rehabilitation was low, or the exercise programme was short or largely unsupervised [13, 14]. These two studies are the largest randomised controlled trials in this area but adopted very different approaches; indeed, the authors of the larger of the two trials were careful not to call their intervention rehabilitation as it did not fulfil internationally agreed criteria . The studies by Eaton et al. and Greening et al. acknowledged the deleterious effects of imposed bed rest and commenced the intervention during the inpatient phase. Eaton et al. went on to encourage participants to participate in post-exacerbation pulmonary rehabilitation, while Greening et al. adopted a much more “light touch, remotely supervised programme”. The conflicting results have stimulated discussion about the design and implementation of pulmonary rehabilitation programmes that would produce patient-important effects [29, 35]. Against this background, the Cochrane review was updated in 2015 with preplanned subgroup analyses of more versus less “comprehensive” rehabilitation programmes. Rehabilitation programmes were considered comprehensive if the programme characteristics were in line with the recent statement of the European Respiratory Society and American Thoracic Society , and the British Thoracic Society Guidelines . They were considered less comprehensive if some components of the programmes were less than the guidance recommendations (e.g. low overall number of exercise sessions, fewer than two sessions per week, no endurance training, or no or little supervision). The 2015 Cochrane review included 17 trials with 1104 participants . There was significant heterogeneity in terms of programme composition and results. While the risk of bias and length of follow-up did not explain heterogeneity, the comprehensiveness of the rehabilitation programmes appeared to determine their effects. The risk of hospital readmissions was greatly reduced in trials offering a comprehensive rehabilitation programme (OR 0.10, 95% 0.04–0.28), whereas no effect was observed in the meta-analysis of trials with a less comprehensive rehabilitation programme (OR 1.10, 95% 0.66–1.82). For mortality, comprehensiveness of the rehabilitation programmes also explained some of the heterogeneity (OR 0.28 (95% 0.10–0.84) versus OR 0.99 (95% 0.13–7.57)) although the statistical power was limited. In terms of health-related quality of life and exercise capacity, the comprehensive programmes showed large effects while the less comprehensive programmes had smaller effects and substantial heterogeneity across trials. The less comprehensive programmes were often not less comprehensive by design but encountered greater challenges in terms of implementation. This can be explained by their ambition to span across settings, i.e. from the hospital to a rehabilitation centre and, sometimes, to the home setting. Such an approach is attractive as it reflects real-world settings. Two recent observational studies reflect the challenges with implementing the results of trials into routine clinical practice. Jones et al. conducted an audit to prospectively document referral, uptake, adherence and completion rates for early post-hospitalisation outpatient pulmonary rehabilitation over a 12-month period. 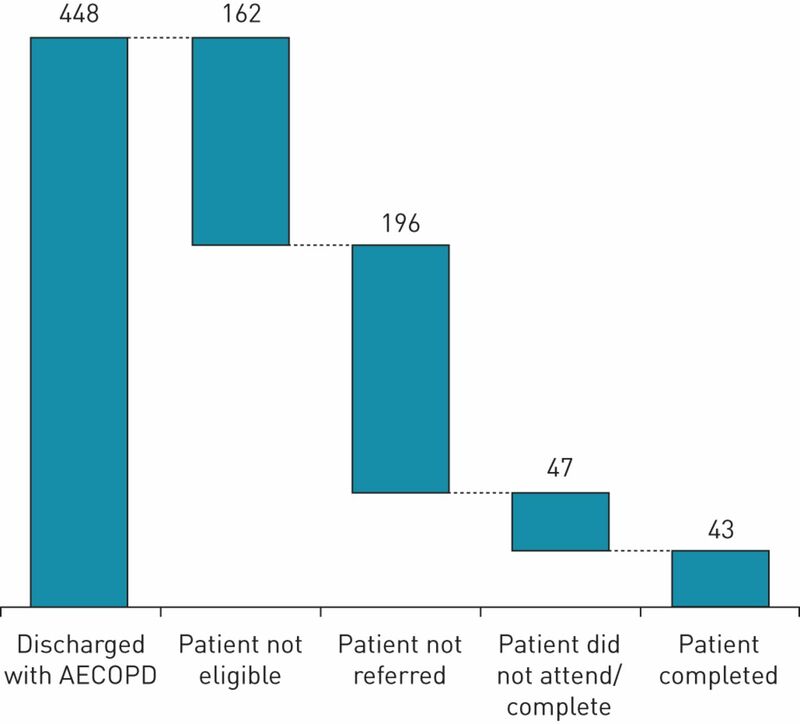 Out of 448 hospital discharges for exacerbation of COPD, only 90 referrals for post-hospitalisation pulmonary rehabilitation were received with only 43 patients receiving and completing pulmonary rehabilitation (9.6% of all hospital discharges, 15% of eligible patients) (figure 1). Similarly, Harrison et al. found acceptance and uptake of pulmonary rehabilitation following an acute exacerbation was very poor, with only 9% completing the programme. The challenge lies in finding an acceptable but clinically effective approach. A delayed offer of rehabilitation may be more feasible given the immediate psychological impact of the disease. The only reported attempt of an early versus delayed rehabilitation intervention did not report a successful outcome  and more recently, a North American study reported similar recruitment difficulties for trial comparing pulmonary rehabilitation with a modest physical activity intervention . An audit of the post-hospitalisation pulmonary rehabilitation pathway in a northwest London hospital. Out of 448 hospital discharges following severe exacerbation of chronic obstructive pulmonary disease, a third of patients were not eligible for pulmonary rehabilitation, principally due to the presence or consequences of co-morbidities. <15% of eligible patients (9% of all patients) completed a post-hospitalisation pulmonary rehabilitation programme. AECOPD: acute exacerbation of chronic obstructive pulmonary disease. Thus, an important focus for future research may include implementation science to explore the integration of comprehensive rehabilitation programmes into the continuum of care of patients with severe exacerbations of COPD, and the creation of incentives for patients, referrers, providers and payers to support comprehensive post-exacerbation pulmonary rehabilitation programmes. Approximately 45% of individuals with COPD decline a referral to post-acute exacerbation pulmonary rehabilitation during the inpatient stay, with practical barriers, including transport and medical appointments, and psychosocial barriers, such as indifference and self-efficacy to exercise, being cited . Recent qualitative research has explored the patient experience of a severe exacerbation of COPD. Exacerbations are described as having a profound emotional effect [39–42]. Heightened anxiety is expressed as stemming from breathlessness and a fear of dying: “It is a matter of life and death – you got to get enough air” . The physical limitations imposed by an exacerbation are viewed as resulting in social isolation, which leads to feelings of depression: “I am always depressed because of the things I cannot do” . When describing the experience of a hospitalised exacerbation, patients frequently refer to their interactions with healthcare providers [39, 42]. A subgroup of patients portrayed healthcare providers as kind and helpful (“They were very helpful and paid close attention – and kind. They would almost see my needs before I did.” ), while others expressed frustration at being dismissed (“They did not take me seriously. When I am not heard, or unable to express my opinion, I get livid. Anger comes with the illness.” ). Listening has been suggested to increase feelings of control and self-worth , which may be particularly relevant following an exacerbation of COPD, as self-conscious emotions have been found to be prominent in the narratives of those who decline pulmonary rehabilitation: “I think sometimes the doctors can be very abrupt with you, as they were this time when I went in…I don't know whether it's my imagination or, I mean doctors are there to treat whoever, you know, and whatever your problem is, I do understand that, but perhaps my guilt thinking oh perhaps they haven't got much patience with me because it's self-inflicted” . Feelings of shame and guilt associated with culpability for the disease can mean patients feel unworthy of dedicated care, leading to the refusal of active interventions . Given the prominence of distress following a severe exacerbation of COPD, the timing of referral for pulmonary rehabilitation requires consideration. During hospitalisation, patients may be more motivated to engage in an intervention that may subsequently reduce future admissions. Patients who participated in an in-hospital exercise intervention found it to be “very helpful, the exercises that were conducted improved my breathing quite substantially” . These findings are in contrast to a recent large randomised controlled trial that found in-hospital exercise to be largely ineffective . However, qualitative methodologies may be more able to characterise the finer-grained issues salient to individuals with COPD, which are not possible to detect using quantitative assessment. Alternatively, at the time of an exacerbation, breathlessness coupled with feelings of distress may compromise patients' ability to absorb the information being provided . Furthermore, the offer of an intervention that inflicts respiratory demands at a time when patients are acutely short of breath can be perceived as a failure to appreciate the seriousness of the exacerbation . Considering the knowledge gleaned from previous qualitative studies [39–42], it would appear that a routine assessment of anxiety symptoms following an exacerbation may be necessary with appropriate psychological support offered. In particular, mindfulness, and acceptance and commitment therapy have been shown to be effective in reducing levels of anxiety in other chronic disease populations [45, 46]. Secondly, a referral for pulmonary rehabilitation may need to be offered when symptoms have improved and individuals are more able to attend to the information being provided. Finally, forming a therapeutic alliance with patients appears to be a key component in enhancing feelings of safety and trust necessary for engaging in an intervention which provokes breathless symptoms. The importance of comorbidities at the time of an exacerbation: do these impact on rehabilitation? In COPD, comorbidities occur frequently, particularly those related to ageing, smoking and physical inactivity, such as cardiovascular disease, lung cancer, skeletal muscle dysfunction, metabolic syndrome, depression and osteoporosis. Comorbidities rarely exist individually: <3% of people with COPD have no comorbidities and >50% of COPD patients have three or more comorbidities . Recent international guidelines recommend taking into account comorbidities in the assessment of COPD , recognising that many influence disease progression and prognosis . The way comorbidities are managed in COPD is also important. For example, COPD patients are less likely to receive a β-blocker at the time of a myocardial infarction, increasing mortality in this population in comparison to people without COPD . Overall, the presence of comorbidities increases healthcare utilisation and cost, increases symptoms and morbidity, worsens quality of life, reduces medication adherence, reduces symptom control, increases medication side-effects, and increases hospitalisations and mortality. Treating comorbidities has a positive impact on COPD. How comorbidities influence the diagnosis, severity and management of a COPD exacerbation is debatable. Where there are common causal pathways for COPD and comorbidities, it is not clear whether during a COPD exacerbation, the comorbidities automatically exacerbate too. Furthermore, differentiating an exacerbation of COPD from an exacerbation of a concurrent comorbidity, such as heart failure or a non-ST elevation myocardial infarction, is not always straightforward. The breathless patient with COPD presenting as an emergency may be labelled as having an exacerbation when in fact these symptoms could represent another diagnosis . Indeed, not only are COPD exacerbations misdiagnosed as other things, exacerbations of other comorbid conditions may be mislabelled as COPD exacerbations. In one study, atypical presentation and delayed symptom awareness at the time of a ST elevation myocardial infarction (STEMI) in people with COPD led to a delay in diagnosis of the STEMI, and subsequently a delay in reperfusion treatment and increased mortality . Misdiagnosis of a COPD exacerbation has a negative impact on patients and misdiagnosis of comorbidities has negative consequences too. 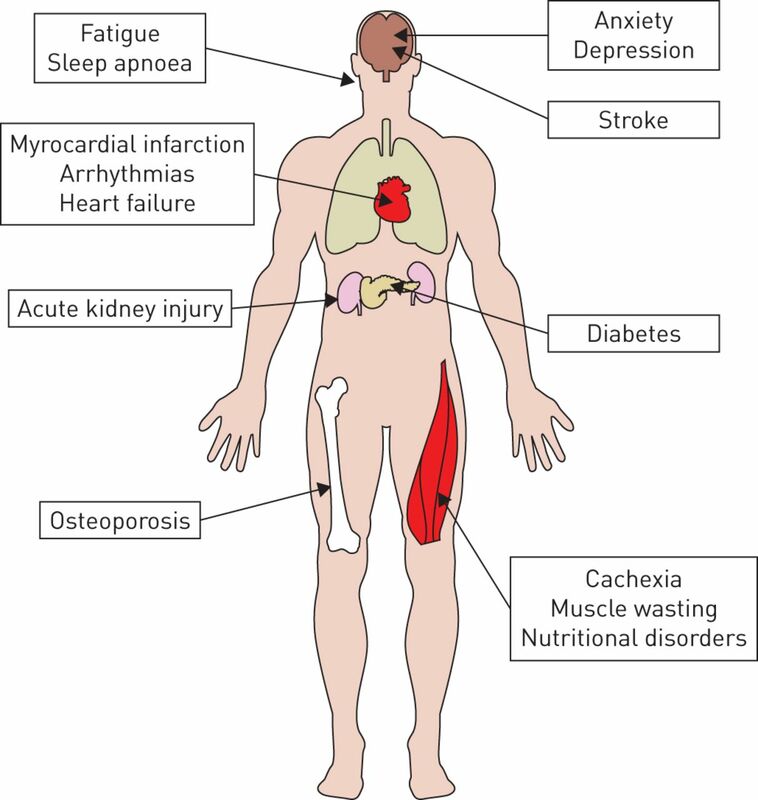 Several common comorbidities may worsen at the time of an exacerbation, such as osteoporosis, muscle strength, heart failure, anxiety, depression and diabetes (figure 2). Exacerbations are heterogeneous events, triggered by viruses, bacteria and environmental exposures. How these triggers affect comorbidities is likely to differ not only with the different triggers but also with the spectrum of underlying COPD. A patient with emphysema and heart failure may not have the same decompensation in heart failure with a virally triggered exacerbation as someone with chronic bronchitis and heart failure exacerbating due to increased pollution. New comorbidities such as a stroke, myocardial infarction  and acute kidney injury  can also occur around the time of an exacerbation. Outside of the acute event, COPD patients with frequent exacerbations are at risk of developing certain comorbidities including diabetes, heart failure, myocardial infarction, rheumatological disease, anxiety, depression, asthma and cancer . It is understandable, therefore, that comorbidities at the time of an exacerbation may prove to be barriers for onward referral for pulmonary rehabilitation. Jones et al. observed that 162 out of 448 hospitalised patients with COPD were ineligible for pulmonary rehabilitation, primarily due to the presence of severe comorbidities such as cardiac instability, terminal illness, severe locomotor or neurological conditions preventing even limited mobility and cognitive impairment. Comorbidities that may arise de novo or worsen at the time of exacerbation. Does pulmonary rehabilitation need to be individualised for people with comorbidities? Physical activity and regular exercise are recommended and beneficial for individuals with several long-term conditions, including COPD, cardiovascular disease, musculoskeletal disease, obesity, diabetes and peripheral vascular disease. Exercise training in the context of pulmonary rehabilitation is extremely important for individuals with COPD and comorbidities, and has been shown to have a positive outcome on comorbidities . However, pulmonary rehabilitation in its current guise may not be maximally benefiting an individual's COPD or their comorbidities. People with anxiety and depression, cardiovascular comorbidities, osteoporosis, and metabolic disease do not have the same positive outcomes in 6 min walking distance or dyspnoea score after pulmonary rehabilitation as COPD patients without those comorbidities, suggesting that there may be scope to modify pulmonary rehabilitation programmes to maximise some of these outcomes . In one study, people with neurological, musculoskeletal comorbidities and obesity had better outcomes in a water-based as opposed to a land-based pulmonary rehabilitation programme . What is clear is that comorbidities are extremely common among COPD patients referred for pulmonary rehabilitation, that the effects of comorbidities on pulmonary rehabilitation outcomes are mixed and that specific conditions may even impact on programme adherence. Certainly, more could be done and opportunities gained for increased screening and diagnosis. Is there a case for self-management support for COPD patients immediately post-exacerbation? Given the potential barriers to pulmonary rehabilitation in the acute setting, it has been postulated that alternative interventions, such as self-management support programmes, may have a role following a severe exacerbation of COPD. Self-management for patients with COPD is complex and challenging, requiring patients to manage various facets of their condition, including understanding and taking their medications appropriately with good inhaler technique, early recognition of exacerbations of symptoms and early instigation of treatment during an exacerbation, receiving annual influenza vaccinations, managing their breathlessness to allow them to undertake activities of daily living, bronchial clearance techniques, taking regular exercise to maintain their lung function and exercise capacity, quitting smoking, and maintaining a healthy diet . Support from healthcare professionals is less well developed than in other long-term conditions, with a variety of available tools but no consistent recommended approach . Interventions are usually multicomponent but it remains unclear which are the most important . A Cochrane review has shown that supported self-management interventions can be effective in reducing future respiratory admissions and improving quality of life among stable COPD patients , although simple self-management education without support is not effective . A recent systematic review of randomised controlled trials assessed the clinical effectiveness of interventions to support self-management among patients with COPD who had recently been discharged from hospital following an acute exacerbation . This review examined interventions that included any component of self-management support and compared them against usual care, control or other self-management interventions. Nine randomised controlled trials were included comprising heterogeneous multicomponent interventions with varied levels of support, from the very comprehensive, year-long GSuST trial using the Living Well with COPD programme , to much shorter and less supported trials such as a telephone-based intervention to aid dyspnoea management  (figure 3). Trials varied in quality; limited patient follow-up and poor reporting were common, particularly among the older trials. No evidence of effect in favour of self-management support was observed for all-cause mortality (pooled hazard ratio (HR) 1.07, 95% CI 0.74–1.55; I2=0.0% (n=5 trials)) or all-cause hospital admissions (HR 0.88, 95% CI 0.61–1.27; I2=66.0%). Heterogeneity could not be explained by level of support of the intervention. The most consistent effects were observed on patients' quality of life, with an overall improvement of 3.8 points in the SGRQ score (95% CI 1.29–6.40, I2=14.6%), which is close to the minimum clinically important difference of 4 points. However, there were substantial and differential losses to follow-up between intervention and usual care, which could have overestimated the effect. There was also a possible reduction in anxiety observed in two trials, although the effect observed was small and should be treated with caution. Overall, although knowledge about COPD improved and patients reported better adherence to medications and more effective use of inhalers, there was limited evidence of effects on health-related behaviours, self-efficacy or health outcomes. 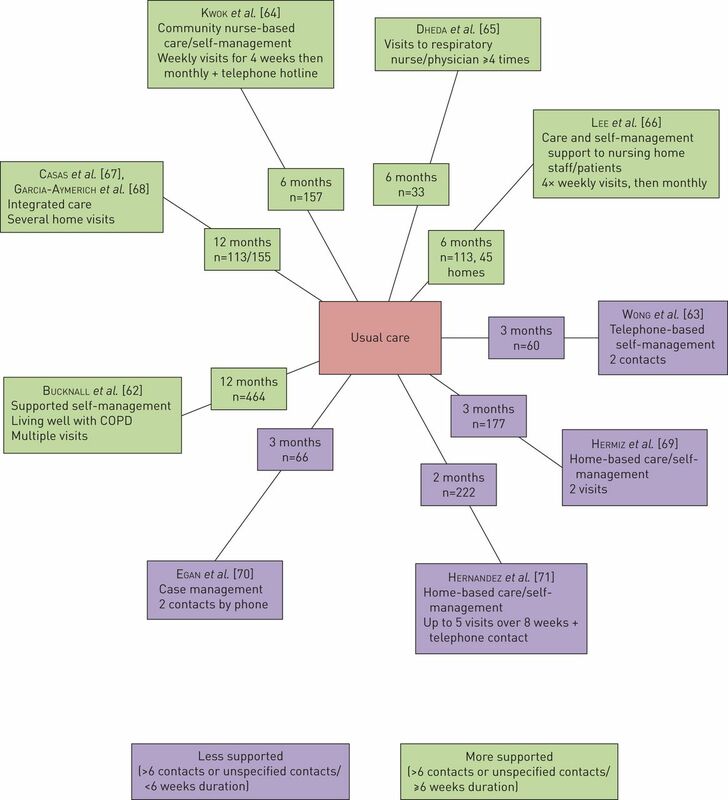 Diagram of included randomised controlled trials of supported self-management interventions post-hospital discharge. Reproduced and modified from  with permission from the publisher. These results corroborate another recently published systematic review, which included fewer trials and used a tighter definition of self-management support . Together, these reviews suggest that there is insufficient evidence to support self-management interventions following hospital admission for severe exacerbation of COPD. Furthermore, recent trials and commentaries have indicated that not all patients are able to self-manage [62, 73]; therefore, future research should focus on careful phenotyping of patients according to their self-management needs and skills, with a view to more tailored interventions. It is clear from the evidence that an acute exacerbation of COPD presents a complex scenario to the healthcare provider and, of course, to the individual (figure 4). The episode provokes a huge disruption to the individuals' physical and psychological well-being. The medical management of patients with exacerbation of COPD is challenged by underlying comorbidities and it is likely that the full impact of the acute exacerbation on other long-term conditions is not fully appreciated. A white elephant or the elephant in the room? Pulmonary rehabilitation following severe exacerbation of chronic obstructive pulmonary disease represents a complex scenario for healthcare worker and patient. There is a clear role for supportive management following severe exacerbation; however, the precise format of the intervention is less clear. Intuitively, a package of supported self-management would seem the right approach, instigated immediately upon discharge, but the evidence is lacking. A more structured and supervised pulmonary rehabilitation programme does have a very strong evidence base, and is consistently recommended by all national and international societies but – and it is a very large but – once implemented as a clinical service, it does not seem to be acceptable to a significant proportion of patients, and perhaps referrers. This presents an interesting challenge for researchers and implementation scientists. Future work requires a collaborative approach with potential service users to develop an appealing and effective intervention that can be delivered around the time of an acute exacerbation that will deliver the desired clinical impact. Support statement: W.D-C. Man was supported by a National Institute for Health Research (NIHR) Clinician Scientist award (CS/7/007), a UK Medical Research Council (MRC) New Investigator Research Grant (G1002113) and the NIHR Collaboration for Leadership in Applied Health Research and Care (CLAHRC) for Northwest London. R.E. Jordan was funded by a NIHR post-doctoral fellowship (pdf/01/2008/023) and the lead investigator of a systematic review of self-management funded by the NIHR Health Technology Assessment programme (10/44/01). J.K. Quint was funded by a MRC Population Health Scientist Fellowship (G0902135). S.J. Singh was supported by the NIHR CLAHRC for East Midlands. This project was part undertaken at the NIHR Respiratory Biomedical Research Unit at the Royal Brompton and Harefield NHS Foundation Trust and Imperial College London. The views expressed in this publication are those of the authors and not necessarily those of the NHS, the NIHR or the Department of Health. , ATS/ERS Task Force. Standards for the diagnosis and treatment of patients with COPD: a summary of the ATS/ERS position paper. Eur Respir J 2004; 23: 932–946. The economic impact of exacerbations of chronic obstructive pulmonary disease and exacerbation definition: a review. COPD 2010; 7: 214–228. Overview of Hospitalizations among Patients with COPD, 2008: Statistical Brief #106. Rockville, HCUP Statistical Briefs, 2006. National Institute for Clinical Excellence. Chronic obstructive pulmonary disease: national clinical guideline for management of chronic obstructive pulmonary disease in adults in primary and secondary care. Thorax 2004; 59, Suppl. 1, i1–i232.
. Rehospitalizations among patients in the Medicare fee-for-service program. N Engl J Med 2009; 360: 1418–1428. UK National COPD Audit 2003: impact of hospital resources and organisation of care on patient outcome following admission for acute COPD exacerbation. Thorax 2006; 61: 837–842.
. Prevention of COPD exacerbations: medications and other controversies. ERJ Open Res 2015; 1: 00011-2015.
. Management and prevention of exacerbations of COPD. BMJ 2014; 349: g5237. British Thoracic Society guideline on pulmonary rehabilitation in adults. Thorax 2013; 68: Suppl. 2, i1–i30. Pulmonary rehabilitation following hospitalisation for acute exacerbation of COPD: referrals, uptake and adherence. Thorax 2014; 69: 181–182. An early rehabilitation intervention to enhance recovery during hospital admission for an exacerbation of chronic respiratory disease: randomised controlled trial. BMJ 2014; 349: g4315. Characterizing and quantifying the symptomatic features of COPD exacerbations. Chest 2011; 139: 1388–1394. Patient understanding, detection, and experience of COPD exacerbations: an observational, interview-based study. Chest 2006; 130: 133–142. Physical activity and hospitalization for exacerbation of COPD. Chest 2006; 129: 536–544. Characteristics of physical activities in daily life in chronic obstructive pulmonary disease. Am J Respir Crit Care Med 2005; 171: 972–977. Effect of 10 days of bed rest on skeletal muscle in healthy older adults. JAMA 2007; 297: 1772–1774. Muscle force during an acute exacerbation in hospitalised patients with COPD and its relationship with CXCL8 and IGF-I. Thorax 2003; 58: 752–756. Rehabilitation and acute exacerbations. Eur Respir J 2011; 38: 702–712. Sarcopenia in COPD: prevalence, clinical correlates and response to pulmonary rehabilitation. Thorax 2015; 70: 213–218.
. Impact of COPD exacerbations on patient-centered outcomes. Chest 2007; 131: 696–704. Walking distance is a predictor of exacerbations in patients with chronic obstructive pulmonary disease. Respir Med 2007; 101: 1037–1040.
. Hospital re-admission in patients with acute exacerbation of chronic obstructive pulmonary disease. Respir Med 2001; 95: 876–884. Readmission rates and life threatening events in COPD survivors treated with non-invasive ventilation for acute hypercapnic respiratory failure. Thorax 2004; 59: 1020–1025. Rehabilitation following hospitalization in patients with COPD: can it reduce readmissions? Respirology 2015; 20: 395–404. The quality of life impact of acute exacerbations of chronic bronchitis (AECB): a literature review. Qual Life Res 2005; 14: 329–347. Usefulness of the Chronic Obstructive Pulmonary Disease Assessment Test to evaluate severity of COPD exacerbations. Am J Respir Crit Care Med 2012; 185: 1218–1224. Can we identify patients with different illness schema following an acute exacerbation of COPD: a cluster analysis. Respir Med 2014; 108: 319–328. Pulmonary rehabilitation for chronic obstructive pulmonary disease. Cochrane Database Syst Rev 2015; 2: CD003793.
. Rehabilitation after an exacerbation of chronic respiratory disease. BMJ 2014; 349: g4370. Pulmonary rehabilitation following exacerbations of chronic obstructive pulmonary disease. Cochrane Database Syst Rev 2015 [In press]. Early versus late pulmonary rehabilitation in chronic obstructive pulmonary disease patients with acute exacerbations: a randomized trial. Respiration 2012; 83: 499–506. Implementation of physical activity programs after COPD hospitalizations: Lessons from a randomized study. Chron Respir Dis 2015; 12: 5–10. “Consumed by breathing” – a critical interpretive meta-synthesis of the qualitative literature. Chronic Illn 2014; 10: 31–49. Narratives of breathlessness in chronic obstructive pulmonary disease. J Clin Nurs 2013; 22: 3062–3070. A qualitative study of unmet healthcare needs in chronic obstructive pulmonary disease. A potential role for specialist palliative care? Ann Am Thorac Soc 2014; 11: 1433–1438.
. How do patients with exacerbated chronic obstructive pulmonary disease experience care in the intensive care unit? Scand J Caring Sci 2014; 28: 741–748. We are not worthy – understanding why patients decline pulmonary rehabilitation following an acute exacerbation of COPD. Disabil Rehabil 2015; 37: 750–756. Early rehabilitation exercise program for inpatients during an acute exacerbation of chronic obstructive pulmonary disease: a randomized controlled trial. J Cardiopulm Rehabil Prev 2012; 32: 163–169. A randomized, controlled trial of acceptance and commitment therapy and cognitive-behavioral therapy for chronic pain. Pain 2011; 152: 2098–2107. Effect of mindfulness training on asthma quality of life and lung function: a randomised controlled trial. Thorax 2012; 67: 769–776. Global Initiative for Chronic Obstructive Lung Disease. Global Strategy for the Diagnosis, Management and Prevention of COPD. www.goldcopd.org/uploads/users/files/GOLD_Report_2015_Apr2.pdf Date last updated: Aril 2, 2015. Comorbidities and risk of mortality in patients with chronic obstructive pulmonary disease. Am J Respir Crit Care Med 2012; 186: 155–161. Effect of beta blockers on mortality after myocardial infarction in adults with COPD: population based cohort study of UK electronic healthcare records. BMJ 2013; 347: f6650.
. Mortality from myocardial infarction in chronic obstructive pulmonary disease: minding and mending the “gap”. Heart 2015; 101: 1085–1086. Closing the mortality gap after a myocardial infarction in people with and without chronic obstructive pulmonary disease. Heart 2015; 101: 1103–1110. Acute kidney injury in exacerbations of chronic obstructive pulmonary disease. Am J Respir Crit Care Med 2014; A5835. Risk factors for acute exacerbations of COPD in a primary care population: a retrospective observational cohort study. BMJ Open 2014; 4: e006171.
. Comorbidities in patients with COPD and pulmonary rehabilitation: do they matter? Eur Respir Rev 2014; 23: 131–141. Water-based exercise in COPD with physical comorbidities: a randomised controlled trial. Eur Respir J 2013; 41: 1284–1291. Supported self-management for patients with moderate to severe chronic obstructive pulmonary disease (COPD): an evidence synthesis and economic analysis. Health Technol Assess 2015; 19: 1–516. van der Valk PD, et al. Self management for patients with chronic obstructive pulmonary disease. Cochrane Database Syst Rev 2014; 3: CD002990. Action plans with limited patient education only for exacerbations of chronic obstructive pulmonary disease. Cochrane Database Syst Rev 2010; 5: CD005074. Supported self-management for patients with COPD who have recently been discharged from hospital: a systematic review and meta-analysis. Int J Chron Obstruct Pulmon Dis 2015; 10: 853–867. Glasgow supported self-management trial (GSuST) for patients with moderate to severe COPD: randomised controlled trial. BMJ 2012; 344: e1060.
. Effects of nurse-initiated telephone follow-up on self-efficacy among patients with chronic obstructive pulmonary disease. J Adv Nurs 2005; 49: 210–222. A randomized controlled trial of an intensive community nurse-supported discharge program in preventing hospital readmission of older patients with chronic lung disease. J Am Geriatr Soc 2004; 52: 1240–1246. Implementation of British Thoracic Society guidelines for acute exacerbation of chronic obstructive pulmonary disease: impact on quality of life. Postgrad Med J 2004; 80: 169–171. Effects of care protocol on care outcomes in nursing home patients with chronic obstructive pulmonary disease. BMJ 2002; 325: 938. Integrated care prevents hospitalisations for exacerbations in COPD patients. Eur Respir J 2006; 28: 123–130. Randomised controlled trial of home based care of patients with chronic obstructive pulmonary disease. BMJ 2002; 325: 938. A randomised trial of nursing-based care management for patients with chronic obstructive pulmonary disease. Lippincotts Care Manag 2002; 7: 170–179. Self-management following an acute exacerbation of COPD: a systematic review. Chest 2015; 147: 646–661.
. Can patients with COPD self-manage? Lancet 2012; 380: 624–625. You are going to email the following Pulmonary rehabilitation and severe exacerbations of COPD: solution or white elephant?